Join myself and others on Valentine's Day! 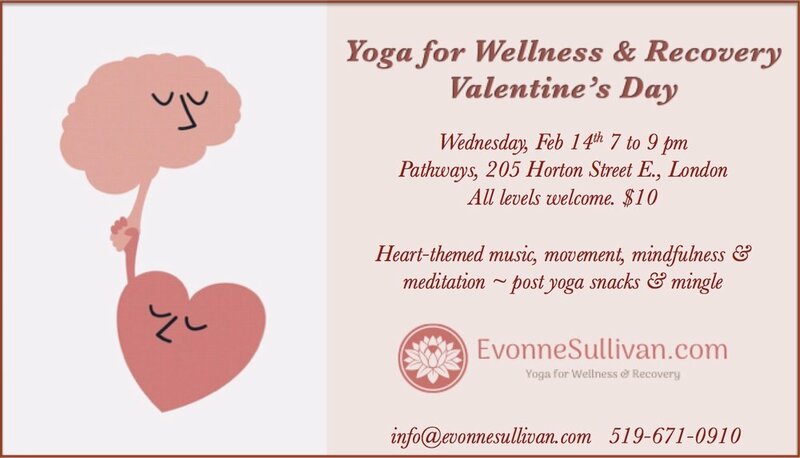 This heart-themed yoga, mindfulness & final meditation will be approximately 75 minutes. It will be followed by a post-yoga mingle. You may bring snacks...or just yourself. Treats will be there regardless. Feel free to also dress in red, white, pink, hearts, flowers etc. attire if you wish! All levels welcome. Yoga for Wellness & Recovery: Focusing on the relationship between mood management and the mind-body connection, sessions offer a combination of breathing, movement, postures, mindfulness and music. Participants will explore the physical, mental, emotional and spiritual benefits of a yoga practice. Classes are for all levels; ideal for beginners while offering more challenging options for regular practitioners.